What may be one of the best-kept secrets in New Canaan is celebrating its 50th season. And while, once upon a time, the New Canaan Dance Club kept a more stringent string on its membership and activities, this season the group hopes to throw open its doors to everyone and invite the community in to shake a leg. The club hosted its first of three seasonal dances Saturday evening at the Carriage Barn Arts Center, whose members are also rejuvenating its mission and were excited to partner with one of the lesser-known, yet longstanding groups in town for this event. 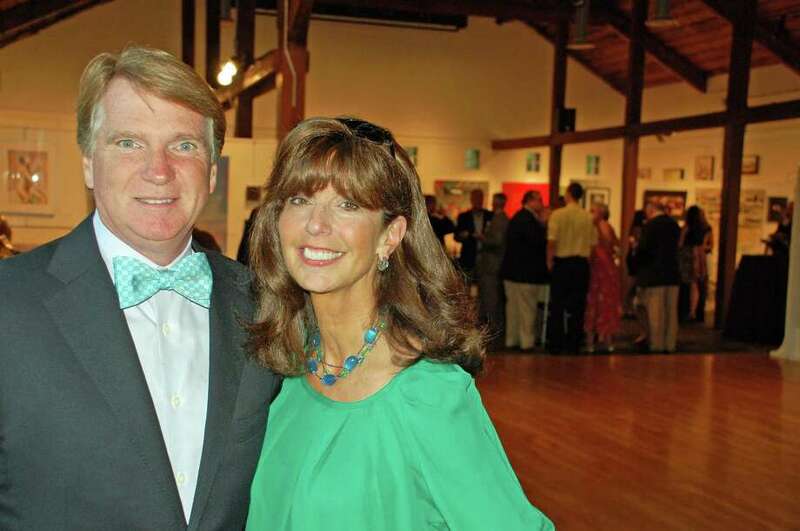 "We're one of the best-kept secrets in New Canaan," Sangeeta Appel, club president, said. "But we don't want to be a secret." In fact, club members are eager to invite new couples who'd like the opportunity to enjoy celebratory social events with other locals, as well as have an excuse to do some dancing. "We don't find many other venues where we can go and dance to a live band,aside from wedding receptions and fundraising galas," Susan Benthall, vice president, said. For decades, she said, the club was at capacity and exercised a more exclusive attitude toward new members, who had to be nominated in order to join. Now that the numbers have dropped somewhat, from a capacity of 120 couples to around 35, the hope is to get more people interested in trying out this friendly forum for a fun evening out. "You don't even have to be a dancer at all," Tim Benthall said. Dancing ability, as well as age of couples in attendance, ran the gamut. To celebrate the start of its 50th season, the club has also moved to less-formal attire, at least for the last summer event. The next one, the holiday dance on Dec. 7 at the Woodway Country Club in Darien, will be a traditional black-tie affair. "It's a sit-down dinner, and it's a band that we've loved for many years," Susan Benthall said. Newcomer Edi Forero said, "This is the first time we're here. It's great. We're really looking forward to good times with this club." While he said he and his wife, Anyely, were not experienced dancers, part of the fun of coming to the event was to give it a try. In addition to a night of rug-cutting, Arianna Kolb, new co-director of Carriage Barn, addressed the dance club to share the barn's new vision. "This is beautiful because it's bringing new audience members into the Carriage Barn," she said of the dance club. In the past, she said, the barn merely rented the space for these kinds of events, but she and co-director Eleanor Flatow want to show their involvement and help the many little-known groups in town realize their potential. "We all need to help each other out," Kolb said. "And there are so many types of organizations like this that are unknown," Flatow said. "There's nothing quite like this," said Susan Doran, who, along with husband Bob, has been a dance club member for 20 years. "It's been well supported through multiple generations," he said. "It's enormously social," she said. "There's nothing quite like it in town."